Web Epoch to exhibit iClickPoint™ at the National Employment Lawyers Association of New Jersey (“NELA-NJ”) annual conference. My long time friend, Fred Shahrooz Scampato, Esquire invited Web Epoch to exhibit iClickPoint™ at the National Employment Lawyers Association of New Jersey (“NELA-NJ”) annual conference. He reminded me of my vision about using iClickPoint™ as a case management tool for litigation attorneys. As I have experience being a client on the plaintiff’s side of several litigation, I had accumulated numerous legal documents versions in my email inbox and/or a single folder on my desktop. As a client, I am the one who is paying for everything and I have the least control over my documents as the case start to evolve during the five to seven year journey. As for the attorneys, their piles of case documents bulging out from existing file system, spilling onto the desktop and spreading across the floor speaks volumes of the need for a more efficient case management system. Web Epoch demonstrated iClickPoint™ & iClickPad™ “Case Management in the Cloud” solution at the NJICLE NELA-NJ annual conference on October 19, 2012 at the NJ Law Center, New Brunswick, N.J., and at another legal conference on November 19, 2012 at Renaissance Woodbridge Hotel in Iselin, N.J.
During conference breaks several attorneys stopped by our vendor table and gave us an opportunity to demonstrate iClickPoint™ and iClickPad™ Case Management in the Cloud SaaS (software as a service) solution. What we discovered was that many law firms and attorneys are using software or a service for remote access to their office PC. This means your PC, server and local network must remain turned on 24x7x365 and you have to pay for its energy cost. In addition, remote access to the case documents has many limitations including slow performance, single user instance and the inability to collaborate. At the November 19, 2012, legal conference, “One attorney shared with me that Sandy left his Law Firm with no power for 10 days!” If this law firm had been using iClickPoint™ & iClickPad™ “Case Management in the Cloud”, then they would have been able to maintain complete access to all of their legal files with no interruption. The reason is that all of their computer files are kept in secure locations on the internet and therefore, the fact that their offices and PCs were without power for ten days was irrelevant. When you evaluate iClickPoint™ & iClickPad™ you will notice the totally new leading-edge “look and feel” with drag & drop intuitive user interface that requires little or no training to start creating your law firm’s case library in the Cloud. 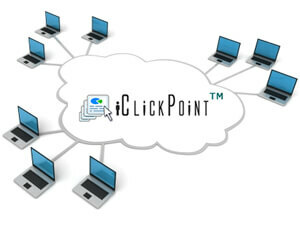 iClickPoint™ online case management solution is simply much more intuitive to use. Anytime and anywhere allows attorneys to review the entire case folder on your laptop, iPad or HTML 5 Tablet. You don’t need to hire an Administrator, iClickPoint™ and iClickPad™ is very are easy to use for online case management. During my conversation with Ron Wronko, Esq., a concern surfaced regarding the thirty plus sub-folders supporting a legal case that would take time to be created and populated by uploading multiple documents. However, iClickPoint™ Case Management addresses this issue with an automated “library creation software tool” that we use to automatically create your case library for you during your initial setup. Each case folder can expand quickly to reveal a hierarchical tree with document titles and thumbnails. You click to enter the document view and page through. You can search by document properties. Our intelligent document builder lets you organize the order of your case sections such as discovery, exhibits, etc and then publish it as a single cohesive file with table of content. This new feature is scheduled to be released in January 2013. From a client’s point of view, I welcome iClickPoint™ “Case Management in the Cloud” presentation builder to help me visualize and organize my case documents and exhibits. I hope you will find iClickPoint™ as the case management tool that you have long been waiting for and find that it is intuitive and easy to use.